New York, NY (June 27, 2018) — As the Senate Committee on Veterans’ Affairs readies for a confirmation hearing today at 2:30PM ET for Mr. Robert Wilkie to be the next Secretary of the Department of Veterans Affairs, Iraq and Afghanistan Veterans of America (IAVA), the leading voice of the Post-9/11 generation of veterans, revealed results of an exclusive poll of post-9/11 veteran views of the nominee. 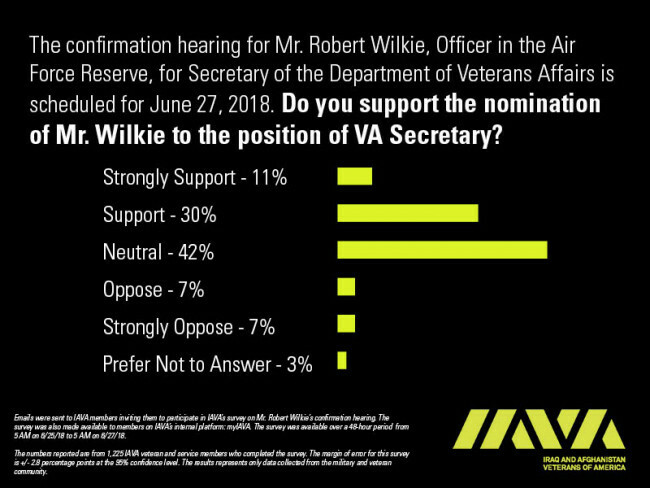 The poll, conducted over a two-day period and surveying more than 1,200 IAVA veterans and servicemembers, found that 41% of veterans support Mr. Wilkie for the role of VA Secretary, 14% did not and 42% were undecided about him for the critical leadership position. IAVA members have also been very vocal about what issues they care about most. During fielding of the survey, the Washington Post reported on Mr. Wilkie’s controversial past work, leading some to call for increased scrutiny–while others defended Mr. Wilkie. IAVA has invited our members nationwide to share their priorities and questions with Mr. Wilkie, with members of the Senate, and with the media. Thousands have responded and many are featured online at IAVA.org here. In 2018, IAVA’s focus is on 6 priorities that our members see as most pressing from among our comprehensive Policy Agenda. This “Big 6” contains the challenges and opportunities that IAVA members care about most–and see as areas where we can uniquely make an impact. IAVA is building on our core four policy priorities from 2017 to elevate and introduce to the nation two long-standing issues that are extremely important to our community – toxic exposure and cannabis. IAVA members are poised to educate the public, design solutions for positive impact, and lead the way to the future—just as we have since our founding in 2004. Each campaign will drive toward outcomes in 4 key areas: 1) Public Awareness 2) Executive Action 3) Legislative Change 4) Local Support.